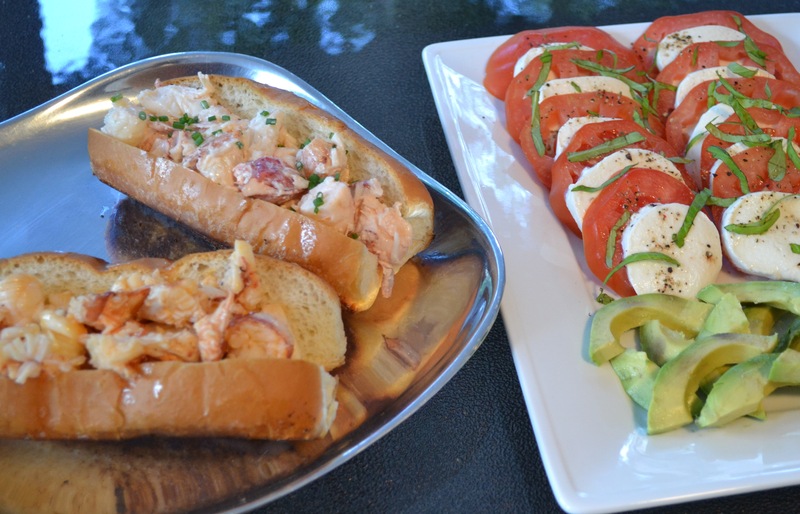 lobster rolls, two ways | Is there any wine left? So I did what all lazy people do. I googled “where can I get a lobster roll in Houston?” because I didn’t want to go to the trouble to make them. Problem is, only about two places had them on their menus and they sounded delicious but too hifalutin (lobster, ciabatta, tarragon aioli, root vegetable kimchi) for what I was craving. I wanted lobster and mayo. Period. So I decided I would just have to make my own. Also, I mentioned to Whitney that butter-drenched lobster rolls were a thing. Not just mayo. He was so excited that I decided to make both kinds. Use shellfish crackers to crack the claws and remove the meat. Also remove the tail meat from the shells. Say to yourself, “Self, you have incredible control and you are not going to eat all of this right this instant.” Congratulate yourself then chop the lobster into 1/2” pieces. For the Connecticut-style rolls, you’ll want to reserve some of the little legs when peeling the lobsters. Okay, here is where the paths diverge. 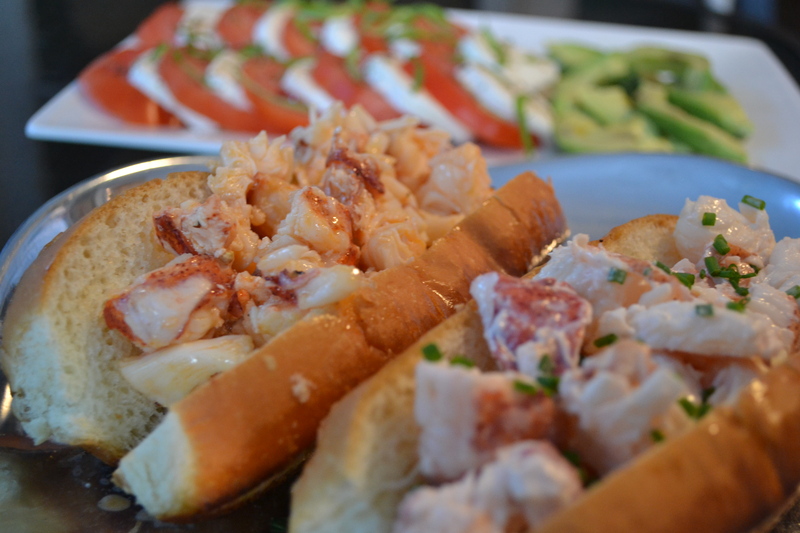 First up, the easy Maine-style lobster rolls. AKA, my love, mayo. In a bowl, combine the lobster, mayonnaise, lemon juice and chives. Make sure all of the pieces of lobster are coated. Stick the mixture in the fridge for about 20-30 minutes, until it is chilly. Next up, Connecticut-style lobster rolls. AKA, buttah. Put the reserved legs in a saucepan with 1 cup water, 6-8 peppercorns and a bay leaf. Bring the mixture to a boil and let cook for 10 minutes. Remove about 2 tbsp. of the lobster stock. Combine it with the juice of 1/2 lemon and 4 tbsp. butter over medium heat. Once the butter is melted, add the lobster meat and stir. Cook for just 1 or 2 more minutes until the lobster is heated through. Split-top hot dog buns aren’t a big thing down here in TX, so I just got regular hot dog buns that hadn’t been cut yet from the bakery section of my grocery story. Slice a thin piece of bread off of each side of the roll so the edges aren’t crusty. Then make a slice down the middle (length-wise) but not all the way through. Heat a large frying pan over medium heat until hot, about 3 minutes. Place 2 tbsp. of butter in the pan. As soon as the butter is melted, lay the buns in the pan and toast until golden brown, about one minute. Flip and toast the second side until golden brown, another minute. Fill the grilled rolls with the lobster mixtures. The lobster in the Connecticut rolls should be served warm and the lobster in the Maine rolls should be cold. Grab a beer and enjoy the evening and the fruits of your labor. We’re drinking Full Sail Pale Ale with this. Its hoppy and slightly sweet and a great compliment to the lobster. One more thing. This butter. Its heaven. We picked it up from the Feliciana’s Best stand at the farmers market in Baton Rouge recently and I am dying over it. I meant that figuratively, but I probably am dying literally too. 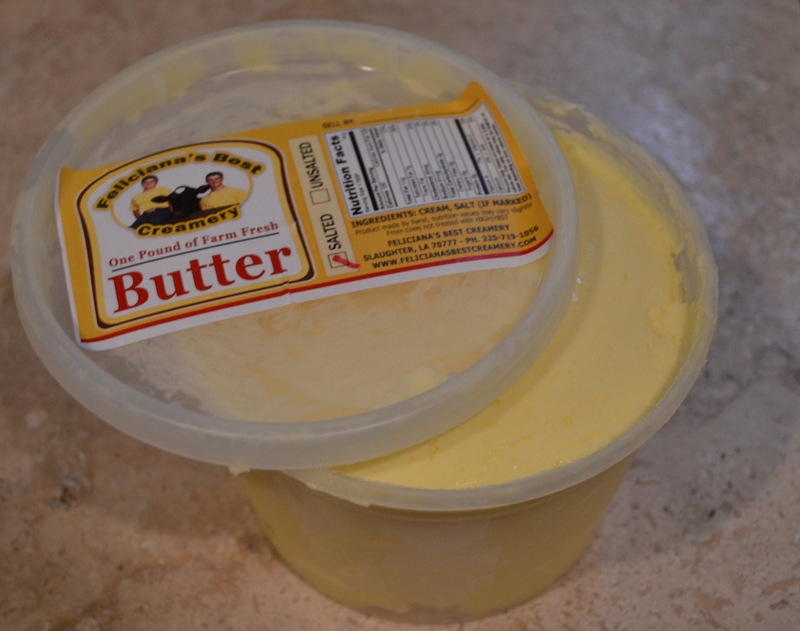 Its like European-high in butterfat, but its SO worth it. Fill a large pot with 1 inch of water and stir in 2 tbsp. salt. Add a steamer rack or basket to the pot. Bring the water to a boil over high heat. 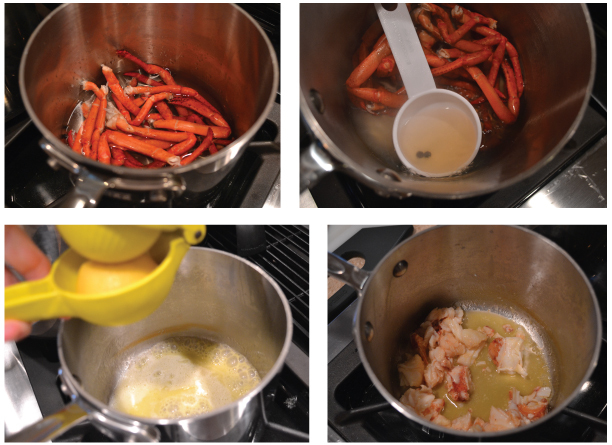 Add the lobsters to the pot, cover, and return the water to a full boil. Reduce the heat and cook at a gentle boil until the lobsters are bright red, about 15 minutes from the time they go into the pot. Remove the lobsters from the pot. When cool enough to handle, remove the meat from the shells. Coarsely chop the meat and put it in a medium bowl. Add the juice of 1/2 lemon, salt, pepper, chives and mayonnaise. Heat a large frying pan over medium heat until hot, about 3 minutes. Place 2 tbsp. of butter in the pan. As soon as the butter is melted, lay the buns in the pan and toast until golden brown, about one minute. Flip and toast the second side until golden brown, another minute. Divide the lobster among the buns and serve immediately. Remove the lobsters from the pot. When cool enough to handle, remove the meat from the shells. Save the little legs but discard the rest of the shells. Coarsely chop the meat and set it aside. Place the reserved lobster legs, peppercorns, bay leaf, and 1 cup of water in a medium saucepan over high heat and bring to a boil. Boil for 10 minutes, then remove 2 tbsp. lobster stock. Over medium-low heat, combine the stock, juice of ½ lemon, and the 4 tbsp. butter. Whisk until butter is melted and combined, then fold in the lobster meat and cook until just heated through. Taste and season with salt and pepper, as needed. Remove from heat and set aside. Heat a large frying pan over medium heat until hot, about 3 minutes. Place 2 tbsp. of butter in the pan. As soon as the butter is melted, lay the buns in the pan and toast until golden brown, about one minute. Flip and toast the second side until golden brown, another minute. Divide the buttery lobster among the buns and serve immediately. As a Mainer-turned-Texan, this was both humorous and sad to read. Humorous because I can totally relate with craving and then obsessing about lobster rolls until I finally broke down and made some myself (despite the fact that it would be ridiculously expensive and not taste anything like lobster back home). But then it turned sad when I noticed you left the rubber bands on the claws! That’s a big no no. Ewww! Uh oh! Thanks for the heads up about the rubber bands. I didn’t know that!